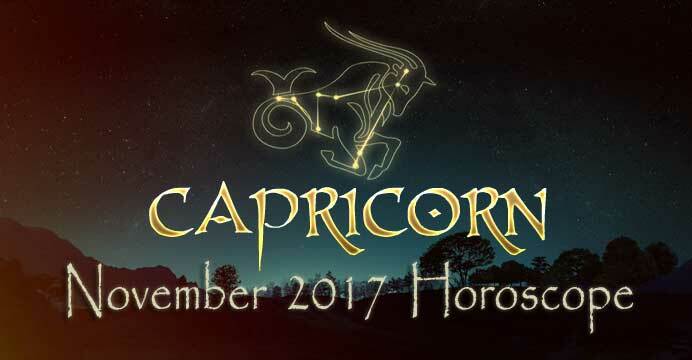 Capricorn November 2017 Horoscope | Capricorn Life - Capricorns Rock! November will be a big improvement over October. The new moon of October 19 was very difficult, along with an opposition of unpredictable Uranus to the Sun and moon. Most people – not only Capricorns – felt quite a bit of tension in the latter part of October. That new moon appeared in your prestigious career sector, and it may have brought up a challenge to your professional reputation or an unexpected twist to the course of your career that you did not expect, straight out of the blue. You might have also heard you have to move or change your living arrangements, again, suddenly. Whatever came up last month will take time for you to fix, because new moons have a long period of influence that can be as much as six months. The harsh part of this aspect is over, however, so by now you know what needs to be done. starting Friday night, November 3, through Sunday, November 5. I hope you can hop in the car and go! Scorpio, or Cancer at 12 degrees, plus or minus five degrees. for he will give you energy, motivation, and drive to get ahead. delicious tidbits, wine, and well-dressed, successful people in attendance – people just like you. Later that week, on Thursday, November 16, you have another lovely aspect, this one also quite romantic, and likely leading you to a party or special occasion dinner. It also looks like you’d have to drive a short distance to get there. Neptune in Pisces will contact Venus in Scorpio, a sparkling configuration. This month will be more social than next month, so live it up, dear Capricorn. Because Venus rules your solar tenth house of honors, awards, and achievement, you may be given a project with room to showcase your most imaginative, original ideas. November will be your productive month of the last quarter of 2017, because next month Mercury will be retrograde from December 3 to 22. I don’t recommend taking a job when Mercury is out of phase. I also don’t recommend you buy electronic items next month either. (Shop for holiday gifts now, not next month! All the express delivery services will have problems making their appointed rounds – they are RULED by Mercury too, so if you wait too long, your relatives and friends won’t get your gift in time. Shop for toys first! We don’t want to disappoint the little munchkins.) 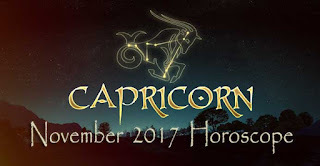 Finally, do not sign contracts in December and no, you can’t rush to sign on December 1 or 2 – those dates are already too late to do so now, as Mercury will have slowed to a crawl by then. This theme of being with others in a social setting will echo through the month many times over. Yet, the biggest message is that you must socialize, and it will come at the extraordinary new moon in Scorpio, 25 degrees, on November 18. It’s time to let go, relax, have a glass of wine or champagne, and say hello to new people. the Sun, Venus, and Jupiter will greet this new moon – what a sweet group of planets. Unlike last month, this month there will be no crosscurrents to spoil the pudding. This new moon’s only mission will be to make you happy. If you were considering the idea of joining a club, either social or professional in nature, you can do so, and you’ll enjoy going to events – do so after November 18. This eleventh house, where the new moon will appear, also rules your hopes and wishes, so this could be the beginning of working toward finally attaining a desire you’ve held close to your heart for a very long time, either material or spiritual. In this enchanting month, anything is possible, dear Capricorn. Scorpio, or Pisces, you will find that planet is lit up and will bring you good news. One last piece of news you should find heartening and perhaps give you something to ponder: Saturn, your ruler, has been in great collaboration with Uranus all year and will continue to do so next year, 2018, until early September. It is so rare for these two powerful planets to work with each other, because it takes Saturn 29 years to circle the Sun, and Uranus takes 84 years. To position them in the perfect mathematical spot in the sky is extraordinarily rare, but that is what is happening now. Uranus is the planet of experimentation, disruption, creativity, and genius. Saturn is the planet of solidity, structure, foundations, and caution. Together they will blend energies for the perfect balance. The message is clear: Experiment and be sure to modernize elements in your life, for doing so is actually safer than standing still and taking the tried and true path. On November 11, these two planets will reach perfect mathematical alignment. You may want to use this day to make an important move. The good news is that you need not be too stuck on the date November 11, for these two planets will remain within orb for a long time, within eight degrees, and most of the time, closer than that. The benefits of these two planets will be yours for months. You can now build a life, dear Capricorn, and it will reflect decisions that will stand the test of time, giving you pleasure as you see your work add up to something big.